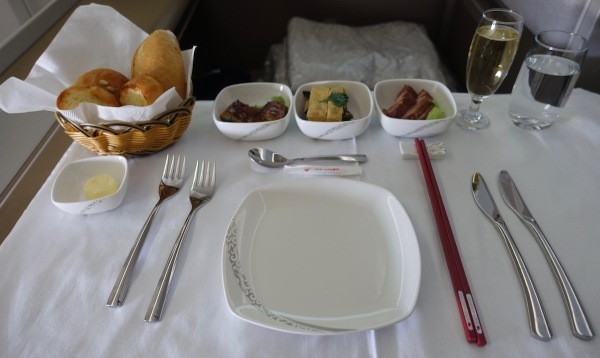 First Class Review - "Forbidden Pavilion"
I flew Air China from San Francisco to Beijing on their new Flagship Boeing 747-8i, the newest and largest 747 aircraft in service today. Generally all 747 aircrafts use door 2L on the lower deck and sometimes, door 6L on the upper deck, depending whether its First Class or Business Class on the upper deck. 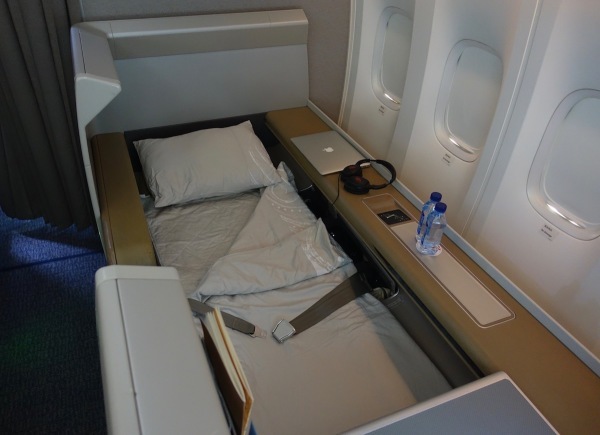 My first impression of the First Class cabin was, the fact that it's stuck between Business Class and Economy Class. 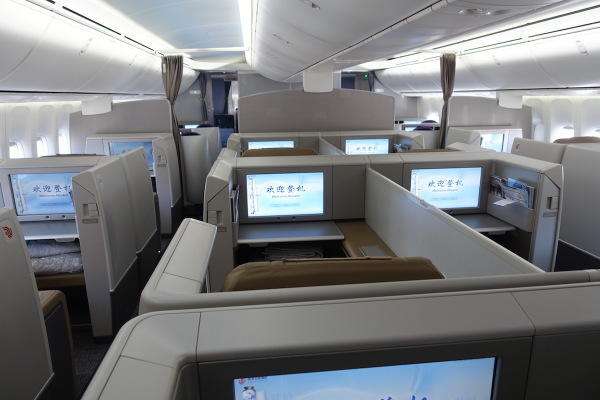 The tradition of cabin layouts is typically First in front, Business in the middle, followed by premium economy and economy in the back. 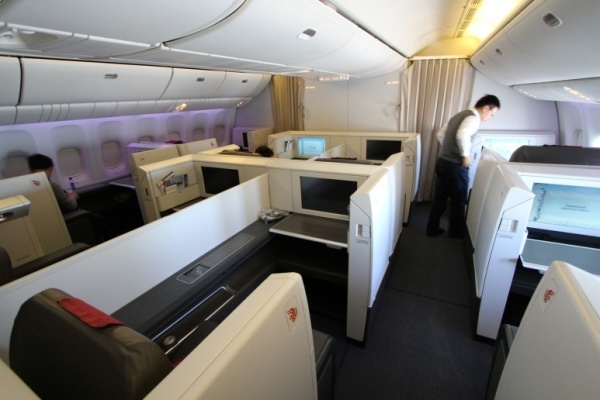 For some strange reason, Air China decided to put their First class suites behind door 2L, right behind Business in the nose section and then economy behind First class. Why? I have no idea. At first, the appearance lacks color and uniquness. The cabin seems spacious as most first class cabins, however, the cubicle 1-2-1 configuration painted in a tan and beige color scheme made feel like I was in a hospital rather than an airplane. 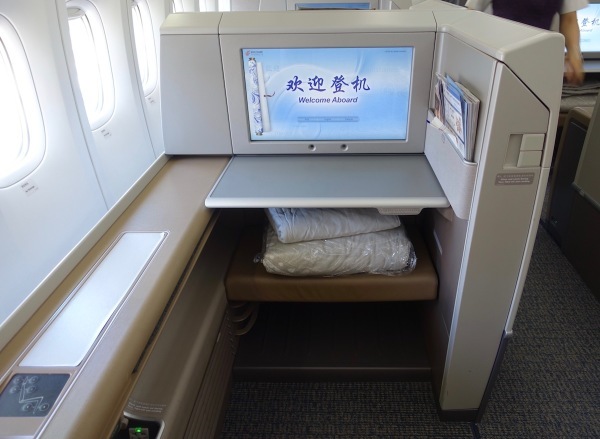 The seats within the mini cubicle suites are spacious and private with all the amenities of an Asian First class from slippers to pajamas. The seat functions were easy to use however sometimes the touch screen feature on the remote was lagging in speed. The food service and quality was decent despite feeling rushed. There was a 3 entree choice between western and asian dishes. The entertainment choices were disapointing. There was a small selection of movies and many of them were chinese films. The Western film choices were limted to movies that were either released a year ago or before I was born. In the bed mode, the lie flat seat was a little too firm and the pillow was too soft and skinny, though the duvet was warmand heavy enough. Out of all the major Chinese airlines, Air China falls short of it's competitors, Cathay Pacific in Hong Kong and China Airlines in Tiapei. The Cabin layout behind door 2L, behind business class and in front of economy class is very strange and not very functional. 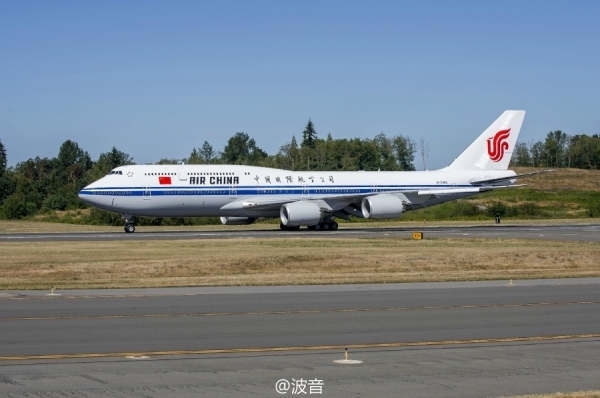 I have yet to learn why Air China has decided to do this. In my opion it's stupid. The cabin appearance is plain and boring. The color scheme is dull and not very attractive to the eye. 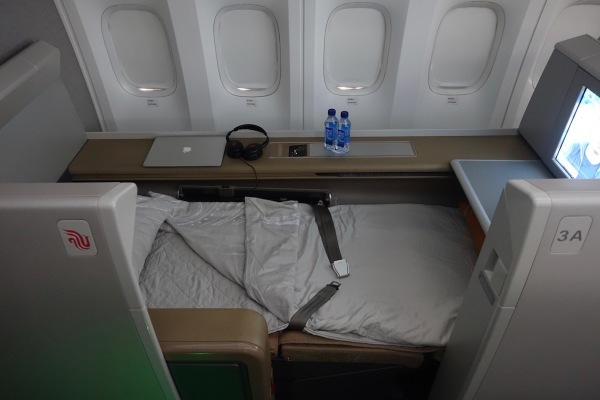 The cabin configuration of 1-2-1 is spacious and roomy, however the choice for cubicle style suites makes the cabin look like an office or hospital rather than an airplane. 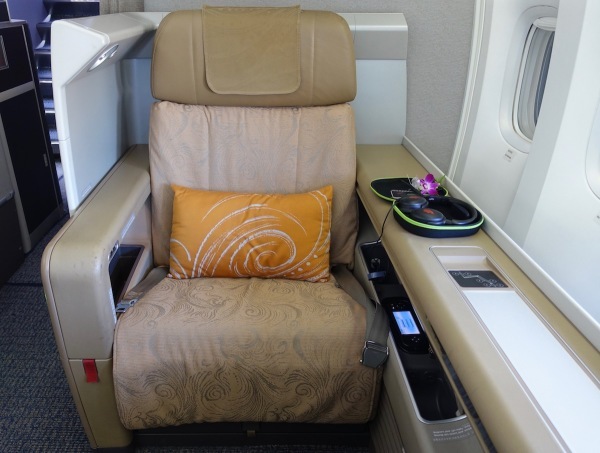 The first class cabin is not large which make sit very private and quiet. 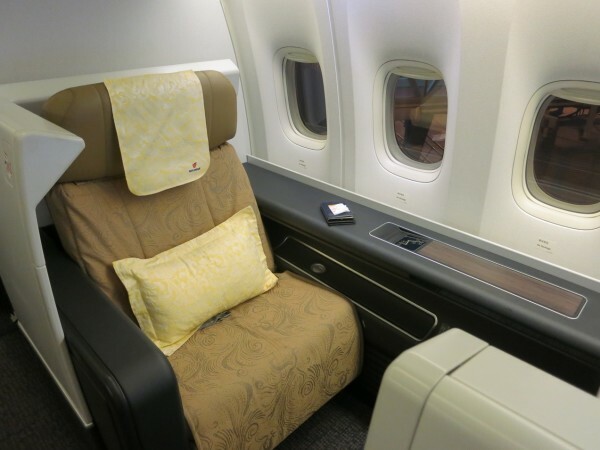 There are two first class lavatories located in the forward section of the cabin which are shared with the business class passengers who are seated in the nose. The cubicle suites offer great privacy but make you feel as if you are in an office or hospital. The suite, does not have a privacy door like Emirates and Etihad, but privacy is not spared. The great thing about the cubicle product is that it has plenty of storage space on the side as well as on top and under your ottoman. The seat cushion is a little to firm and the pillows, despite looking fluffy and full, are thin and stuffed with air and very little poly fill. In the fully flat position the seat is spacious enough to sleep sideways. The functions of the seat are easy to use however the remote control lags at times and seems flimsy. 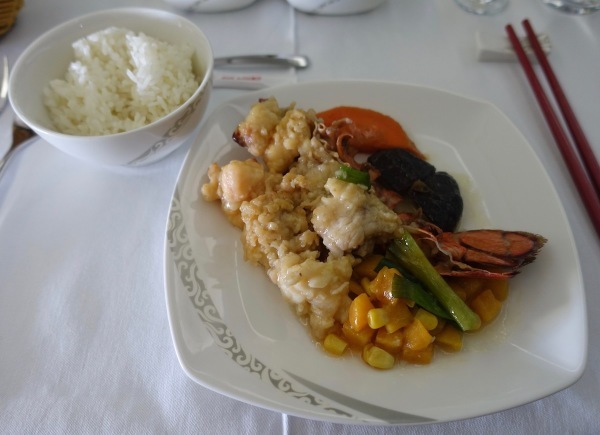 Many Asian carriers I have flown with whether in first class or business class don't have a great selection of entertainment as those carriers from the US or Europe. There are not many choices of films and the Western movie that are available are by no means brand new releases. There is a great selction of Chinese films and Chinese radio. There are no books or live television offered. The interactive map is simple and easy to use to track your flight route. Air China offers noise cancelling headsets, however they aren't really noise cancelling, but they do help a little to drown out the noise. The 4 course service consists of h'orderves, which is some strange fruit and nut dish with your drink, followed by an appetizer salad or soup or both, followed by the main dish and then dessert. The service felt rushed, as if the crew were all in a hurry to start their break, or better known as a crew rest. I ordered the lobster tail dish which was the only Western dish out of the three choices. The lobster was cooked too much and very dry. The best part of the meal was the bread basket which gave you several choices of soft warm bread and butter, which i loved.